At Zizira we are always concerned about product purity and quality. Because when we promise the best we mean nothing but the best. Incidences of adulteration in foodstuffs raise a morbid fear in us. Because of this, we have made it a policy in the company to source our raw material from nowhere but the very source itself, and not via media. That way we can ensure 100% genuineness in our product line. 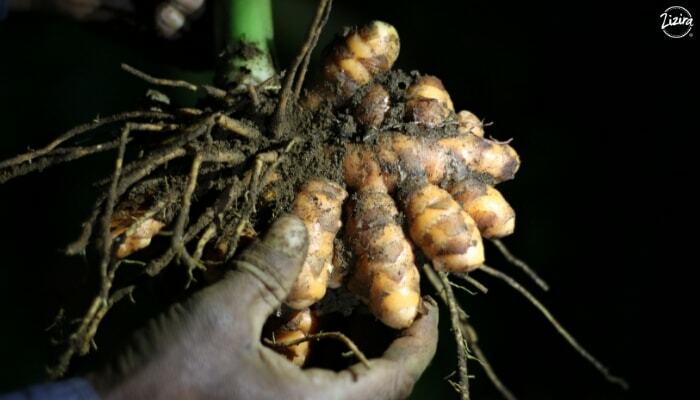 This is how we source our Lakadong turmeric – from the very farmers who grow it. As with every product, it is the same with turmeric, our primary commodity. Turmeric is widely in demand because of its prized ingredient curcumin which has myriad health benefits. Massive amounts of research on curcumin keep unravelling more amazing properties. No wonder the rush and clamour for the golden yellow spice. Our customers’ trust in us is the driving force behind our propensity for pure quality in every one of our products. 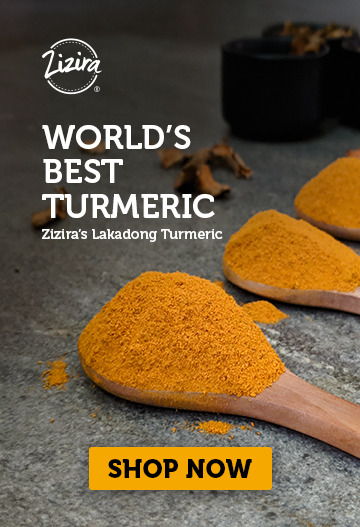 Our turmeric product is pure Lakadong, the world’s best turmeric with the highest curcumin content. To obtain the best we left ourselves with the one and only choice: go to the people who produce it, in their very turf. We now take you to Lakadong country. These are clusters of villages about 90 Kms east of Shillong, Meghalaya’s capital. 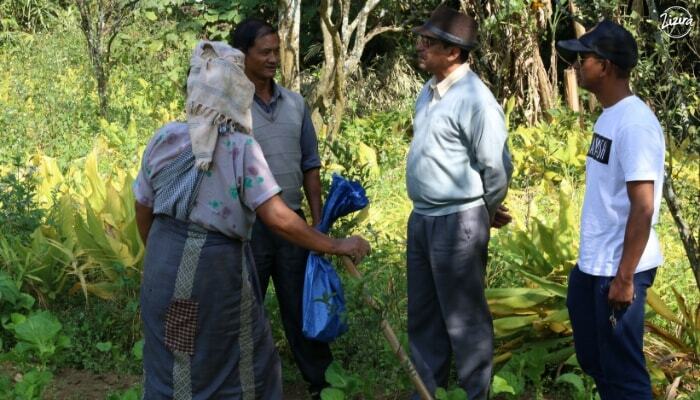 These villages in the vicinity of Lakadong lay in the Laskein Community and Rural Development (C & RD) Block of West Jaintia Hills district of Meghalaya. The entire Block is famous for the Lakadong Curcuma longa, the turmeric with the highest curcumin content of an average of 7.8%. Sometimes over 8%. It was Friday the 22nd of November 2018. At 7 in the morning, the sun had already risen more than a good hour. Bah Teddy, Zizira’s General Manager’s phone call came. We had decided the previous day to leave early to evade traffic snarls at later hours which is common on highway NH6. That way it would be a pleasant 2-hour drive. I stood waiting on the highway near our house in Laitkor, 10 Kms from Shillong, just below the summit of the Shillong Peak on the south-western face. Ten minutes later Bah Teddy’s Ford EcoSport soon swung into view. The November weather was ideal, the early morning traffic was almost non-existent as we cruised steadily eastwards. After crossing the Smit junction the trail starts its gradual descent, coursing through undulating hills and rolling meadows. 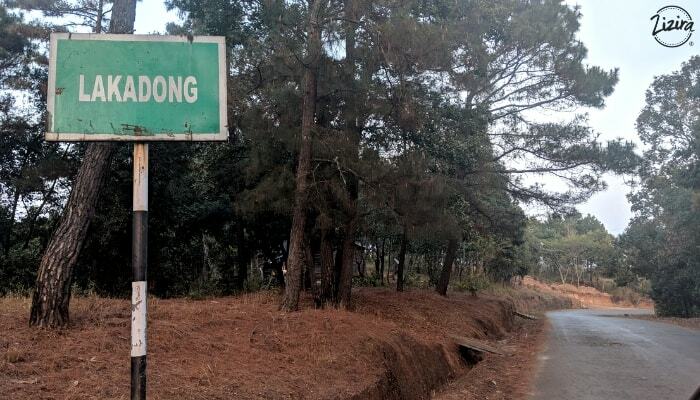 20 minutes later we had reached Mawryngkneng, the junction where the Shillong Bypass meets NH6. Most heavy lorry traffic bound from Assam to the Barak Valley areas use the Bypass. A little ahead lay Puriang, a junction famous with motorists and travellers who stop for food and freshening up. We too stopped for tea and ‘putharo’, a dry-roasted pancake-like flatbread made of powdered rice. Minutes later we continued on our way. The vegetation has now changed a bit. The sparse shrub grasslands of the higher reaches now give way to thicker deciduous sub-tropical foliage. Pine needles now interspersed with broad leaves. We crossed the beautiful man-made Thadlaskein Lake, shimmering in pristine glory in the morning sun. The highway, we feel, has robbed it somewhat of its former splendour. Bah Teddy is an interesting personality. He had so much to share about the company’s vision, mission and commitment to its customers. His enthusiasm and dedication are keenly visible. No wonder the entire team is so inspired and spirited it reflects in their sincerity and singular-mindedness of purpose. This trip is also about that purpose. Bah Teddy and his entire team believe their company is about giving customers the best solutions to their problems. An hour had passed without our realising it. We arrived at the junction where we had to change the route to State Highway SH7. Soon Shangpung loomed before us. Long before Lakadong turmeric got its name the yellow spice used to be called ‘Shangpung Turmeric’. Shangpung was among the few developed villages of earlier days, a market hub with better facilities. Farmers and traders converge there from many villages surrounding Lakadong such as Iooksi, Sumer, Umchalait, Saphai, Sahsniang, Mawkaiaw and a host of others. They brought their turmeric to Shangpung to be grounded, packed and despatched to other market hubs, notably Jowai and Shillong. The nomenclature ‘Lakadong’ comes from the area of the same name where the spice, locals say, grew plenty in the wild. Farmers then planted it everywhere in Laskein Block. 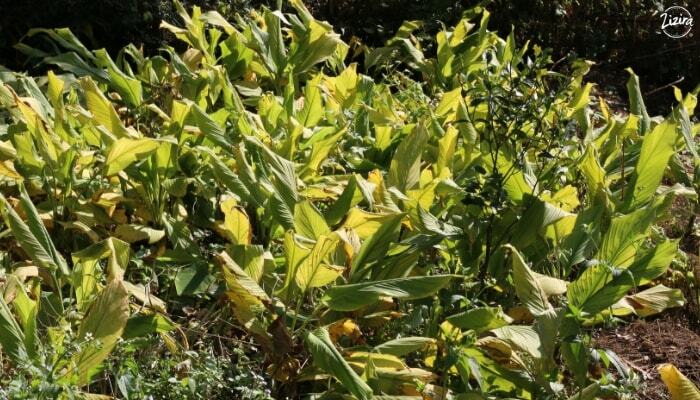 Now almost every household has a patch of Lakadong turmeric growing somewhere around their homesteads. But people are divided about this nomenclature. The Lakadong residents insist their region is the source. Others disagree. But the fact remains: the spice has the same, or similar, characteristics wherever it grows in the Block. It was now about 10 AM. We reached Raliang Police Outpost, a few kilometres short of our destination at Bah Shadap’s house. Bah Shadap, a man of slight frame and father of five wears a permanent pleasant demeanour and ever-smiling face. He is Zizira’s foremost soldier in its quest for pure Lakadong turmeric. In his village, he is a much-respected elder of the local Church and has good standing in the community of villages in Laskein Block. Hectic activity greeted us as we reached our destination. Bah Shadap’s wife was already in the kitchen preparing a sumptuous meal of free-range local chicken and vegetables fresh from the garden. 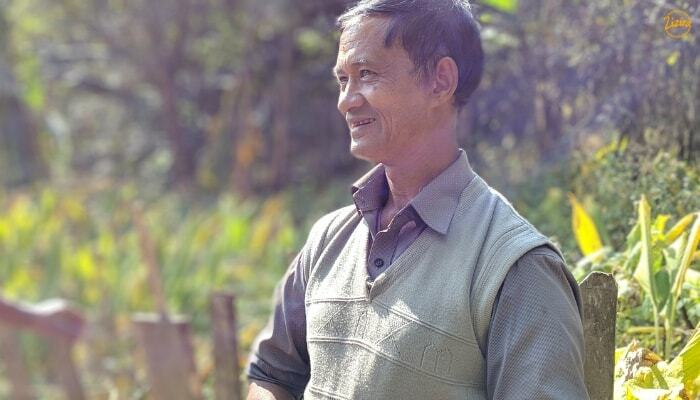 The rice comes from their own fields – home-pounded nutrient-filled red grains, quite unlike the nutrient-starved polished white rice we eat every day. We felt suddenly very hungry! Zizira’s vanguard team was already there, hard at work to complete building a wood-fired dryer – two dryers in fact. Brain-child of Zizira’s CEO Ralph Budleman and his loyal ‘brainstorm troopers’. The dryers will dry the turmeric flakes and slices superfast on site itself. The technology is indigenous, low-cost, and sustainable. This one equipment will eliminate many potential hazards, nipping them right at the critical points. Advantage: the Customer. There are many stories to share but we’ll save those for later. For a start we have to emphasise our commitment: the customer has to have the best deal. The problems that plague the customer, the doubts, the scepticisms…all have to be resolved. So when customers use our products they know they have the best of the best; pure and unadulterated. They get more than their money’s worth. They get trust. At Zizira we engage ourselves involving, dedicating and innovating with that singular goal in mind: your full and unadulterated satisfaction with no lingering doubt. With Zizira, you revive and regenerate. Stay tune for more stories, subscribe to our newsletter. Retired senior executive from Air India, he is back in his home town, indulging in his passion for farming and writing.